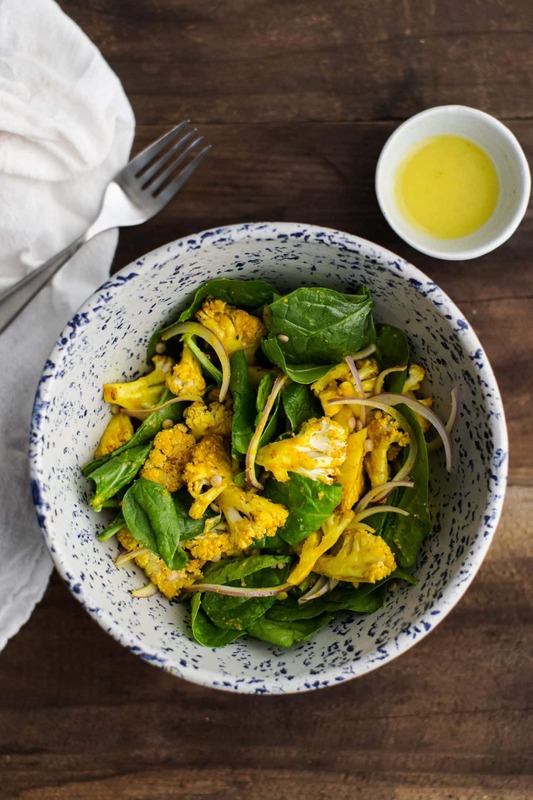 Turmeric Tahini Roasted Cauliflower Salad | Naturally. Turmeric seems to be all the rage right now and with good reason. It adds a beautiful pop of color, a slight earthy flavor, and pairs well with so many other items. This roasted cauliflower salad is a perfect example. 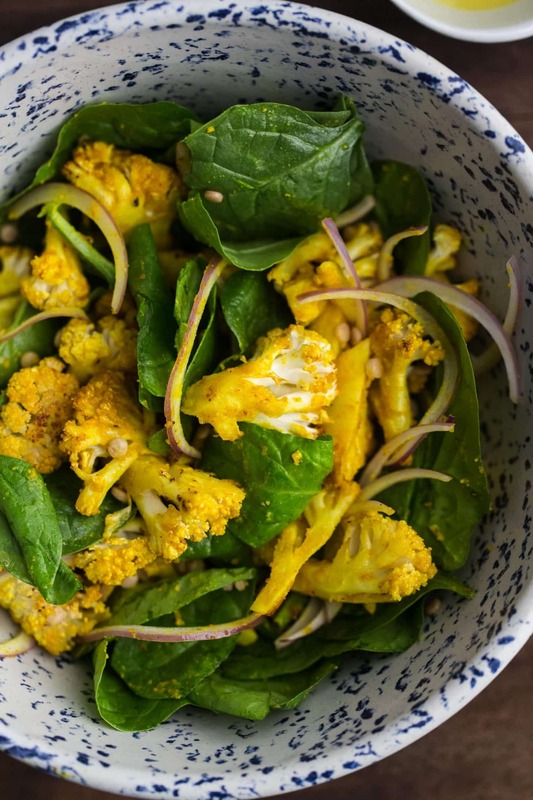 The tahini adds a slight sweetness to the roasting cauliflower while the turmeric brings a nice savory balance. I found myself eating the cauliflower right off the sheet tray before I could toss it in the salad. Preheat oven to 375˚ F. Place cauliflower florets in a roasting pan. In a small bowl, whisk together tahini, olive oil, lemon juice, turmeric, and salt. Pour over the cauliflower and toss until cauliflower is coated. Roast until cauliflower is starting to brown and tender, 25 to 30 minutes. Remove and let cool slightly. Place spinach, red onion, and couscous in a bowl. Add in the cauliflower. Whisk together ingredients for the dressing and pour over salad. Toss until the salad is just combined and coated with the dressing. I find that cauliflower is one of the better options for roasting with extra flavors and sauces. 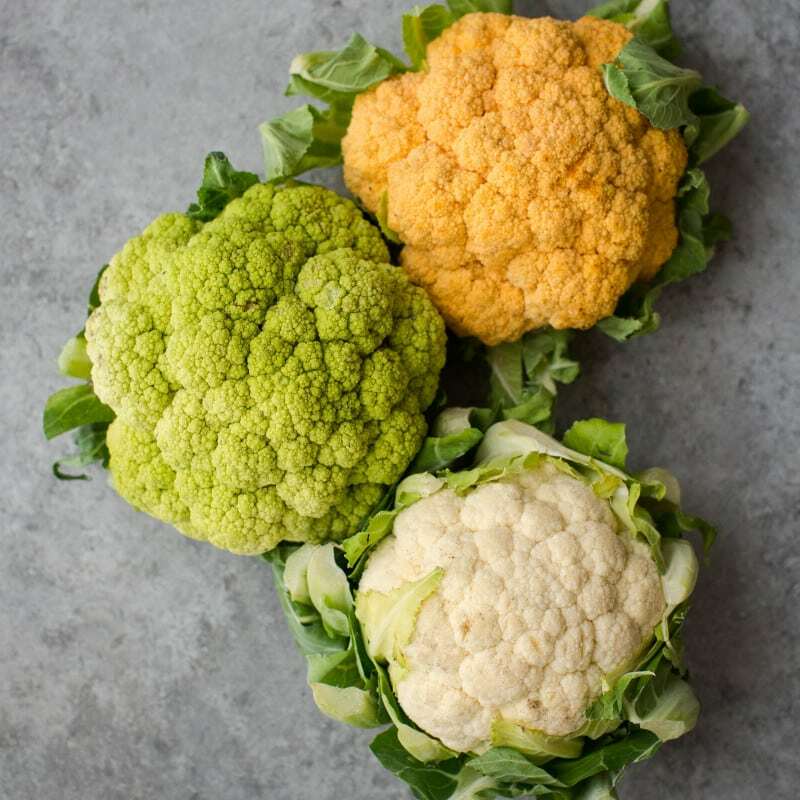 The cauliflower holds the flavor and color, still roasts well, and creates the perfect topping for salads, grain bowls, and wraps. However, if you’re unable to find cauliflower easily, broccoli would be my next option. Grains: I have a slight obsession with pearl couscous but I know that it’s not really the healthiest option. Use a nice, chewy grain like sorghum, farro, or oat groats in place of the couscous if desired. Spice: I love to a teaspoon or so of sambal oelek to the tahini mixture. The spicy aspect is amazing with the sweet/savory combination. Alternative Uses: Use this cauliflower in a wrap, as the topping to a grain bowl, or even as a filling to grilled cheese crepes (like this recipe). I’ve tried turmeric in curry and it’s so deliciously full of flavors, aromatic comfort and a serious spice kick. I can imagine how delicious it is in a cauliflower salad! I bet this is even better than the one served at Lemonade (which is not very good!)! I love the way turmeric colors everything! This cauliflower is gorgeous. Thanks for this incredible recipe. I made it twice in one week. Divine! Also wanted to let you know that I gave your recipe a little love on my blog. I didn’t reprint it, just wrote about how great it was and provided links to your page. In the spirit of full disclosure and celebrating women doing great things on the internet!